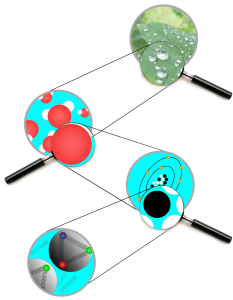 If we take a small object (like a rain drop) and divide it into even smaller pieces, we find that it is made up of atoms! It turns out that even atoms can be further divided into electrons and a nucleus consisting of nucleons (i.e. protons and neutrons), which are finally built up of quarks. According to our current knowledge, quarks and electrons are fundamental — they can be divided no more and have no internal structure and no spatial extension. Gravity: lets apples fall from trees, the carrier of which has not been observed yet. It is referred to as<stronggraviton. Electromagnetic interaction: makes lightning in a thunderstorm and is the basis of all electricity and magnetism. It is mediated by the photon. Weak interaction: is responsible for the energy production in the sun and for radioactivity. Its force carriers are called W, Z bosons. Strong interaction: binds protons and neutrons to nuclei and quarks to nucleons very strongly via the gluons. All known fundamental particles in the Universe can be classified as matter constituents, force carriers and particles responsible for the creation of mass. Their behaviour is well described by the Standard Model of Particles Physics, the component of which are summarised in the following picture. Quarks and leptons are the matter constituents. These are all particles with half-integer spin, known as fermions. To a good approximation the proton is made of two up quarks and one down quark. There are also heavier copies of these two quarks: the charm, strange, bottom and top quark. The electron is a lepton and it has also heavier copies: the muon μ and the tau τ, as well as neutral partners: the neutrinos ν. All known fundamental forces are transmitted via force carriers, called gauge bosons, as described above. Having particles with a non-vanishing mass (as we observe in nature) leads to mathematical inconsistencies of our theroy. A possible solution was the postulation of a new, unknown particle that is able to elegantly solve this problem: the Higgs Boson. Gravity is not included because we do not have a quantum version of it and its effects are also negligible in the microworld. It is well described by the Einsten’s General Theory of Relativity and physicists are trying to find a model which can embed both the Standard Model and the General Relativity. When we see an object, our eyes are working as detector! Light is emitted by the Sun and travels to Earth before bouncing off objects and being recorded in our eyes. With a normal microscope we can only resolve objects that are as large as the wavelength of light, which is about the size of small bacteria. Our microscopes for looking into the sub-atomic world are particle accelerator and for smaller objects we need shorter wavelengths – which for physicists is equivalent to higher energies. The highest possible energies in thelaboratory can currently be created with the Large Hadron Collider (LHC) in CERN, making it our biggest microscope. In every second at the LHC, we can have 600 million collisions of a proton with another proton. The energy of the proton beam in the LHC corresponds to the energy of a 200 ton train with a velocity of more than 100 mph! 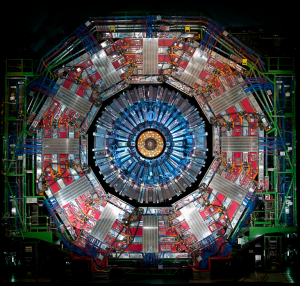 With the LHC we can see structures that are more than 100 billion times smaller than bacteria! With other experiments, we are also able to observe particles produced in the Earth’s atmospehere, in the Sun, or in the Universe billions of years ago. The word comes from Greek and means "indivisible". Atoms are very small: typical sizes are around a ten-billionth of a meter! The electron is an elementary particle with a negative elementary electric charge. They have no known substructure and their mass is approximately 1/1836 that of the proton. The name comes from the the Greek word for "amber". The nucleus is the center of an atom is surrounded by the electron cloud . A proton is a composite particle with a positive elementary electric charge. is the defining property of any chemical element . The word proton is Greek for "first". neutrons have zero charge . They are slightly heavier than protons, property which make them unstable particles. They decay into protons with a lifetime of 11 minutes . called hadrons , like protons and neutrons. Their discoverer, Murray Gell-Mann, found the word "quark" in James Joyce's book Finnegans Wake . the force of gravitation in the framework of quantum field theory . If it exists, the graviton is expected to be massless. including radiation such as light. Its name, indeed, comes from the Greek word for "light". The photon has zero mass and always moves at the speed of light within a vacuum. therefore they decay quickly into lighter particles. For this reason they can only interact weakly . 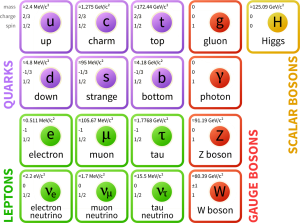 The W boson is named after the "weak force", whereas the Z boson is called like this because it has "zero" charge. forming protons, neutrons, and other hadrons. The gluon-gluon interaction is so strong that it confines quarks within composite particles. This limits the range of the strong force to the size of an atomic nucleus. but it is sensibile to the weak force and, if with a charge, to the electromagnetic force . The name lepton comes from the Greek and means "thin". The spin is an intrinsic properties of subatomic particles. All elementary particles of a given kind have the same value of spin. This term designates a particle with a half-integer spin, e.g. 1/2 3/2 5/2 etc. identical fermions cannot occupy the same quantum state. 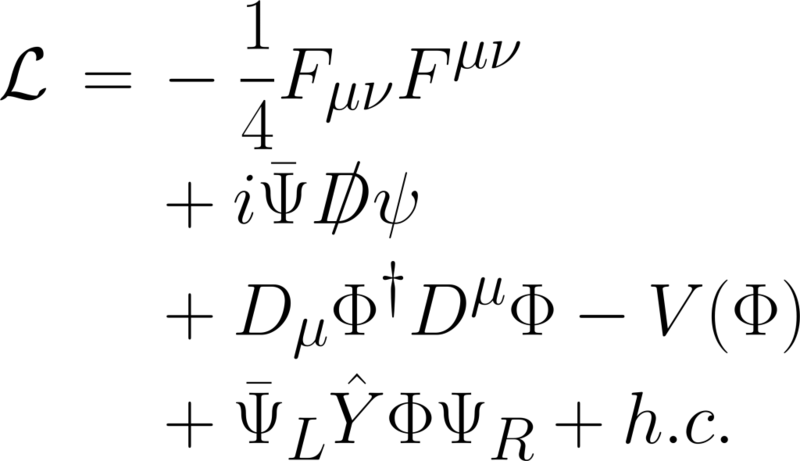 As bosons, the force carrier all have an integer spin , specifically of 1. Being a boson, the Higgs boson has integer spin, but its value is 0. This kind of particles are called scalar bosons. It was first theorized in 1964, but only discovered in 2012 at the LHC. which describes the dynamics of a system. they need from the Lagrangian. General Relativity is the best description of gravity we have. in the late 2015. It is also necessary to make the Global Positioning System work correctly. devices used to track and identify particles produced in physics interactions. They usually can measure energy, momentum, spin, and charge.